The Harvard-Smithonian Center for Astrophysics researchers who found the first hypervelocity stars escaping the Milky Way also turned up a dozen double-white-dwarf star systems. A white dwarf is the hot, dead core left over when a sun-like star gently puffs off its outer layers as it dies. The object is awesomely dense, packing as much as a sun's worth of material into a sphere the size of Earth. A teaspoon of it would weigh more than a ton. The team estimates that half of those are merging and might explode as supernovae in the astronomically near future. Nearby planetary nebula NGC 2440 shown above, houses a scorching hot white dwarf with a surface temperature of 200,000 degrees Celsius. "These are weird systems – objects the size of the Earth orbiting each other at a distance less than the radius of the Sun," said Smithsonian astronomer Warren Brown, lead author of the two papers reporting the find. The white dwarfs found in this survey are lightweight among white dwarfs, holding only about one-fifth as much mass as the Sun. They are made almost entirely of helium, unlike normal white dwarfs that are made of carbon and oxygen. 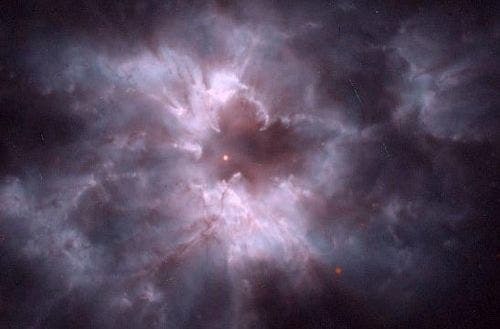 "These white dwarfs have gone through a dramatic weight loss program," said Carlos Allende Prieto, an astronomer at the Instituto de Astrofisica de Canarias in Spain and a co-author of the study. "These stars are in such close orbits that tidal forces, like those swaying the oceans on Earth, led to huge mass losses." The binary star system J0923+3028 consists of two white dwarfs that are gradually spiraling in toward each other. In about 100 million years they will merge. Since their combined mass is too low to result in a supernova (i.e. less than the Chandrasekhar limit), a single, more massive white dwarf will be left after the merger. Nuclear fusion of a shell of material on the surface will result in a flash of light like a supernova but fainter. Because they whirl around so close to each other, the white dwarfs stir the space-time continuum, creating expanding ripples known as gravitational waves. Those waves carry away orbital energy, causing the stars to spiral closer together. Half of the systems are expected to merge eventually. The tightest binary, orbiting once every hour, will merge in about 100 million years. "We have tripled the number of known, merging white-dwarf systems," said Smithsonian astronomer and co-author Mukremin Kilic. "Now, we can begin to understand how these systems form and what they may become in the near future." When two white dwarfs merge, their combined mass can exceed a tipping point, causing them to detonate and explode as a Type Ia supernova. Brown and his colleagues suggest that the merging binaries they have discovered might be one source of underluminous supernovae — a rare type of supernova explosion 100 times fainter than a normal Type Ia supernova, which ejects only one-fifth as much matter. "The rate at which our white dwarfs are merging is the same as the rate of underluminous supernovae – about one every 2,000 years," explained Brown. "While we can't know for sure whether our merging white dwarfs will explode as underluminous supernovae, the fact that the rates are the same is highly suggestive."